Current Early Entrance Program student and former Whitney High School student Rushabh Doshi will be headed to Johns Hopkins University as an incoming junior this upcoming fall semester to study Public Health. His goal is to become a medical doctor. “My parents have been my greatest influence. Seeing them thrive and do exceptionally well in their respective medical careers inspires me and motivates me to do just the same. My brother has always supported me and has stuck behind me. My family has simply been great, this wouldn’t be possible without them,” Doshi told HMG-CN. Halfway through his sophomore year, Doshi learned about the Early Entrance Program at California State University of Los Angeles, a program that allows gifted students as young as the age of 11 to go to a university setting and advance their education. After seeing the opportunities that the Early Entrance Program could provide for his career, Doshi applied, passed the required tests, and underwent a rigorous 6-week academic summer session. 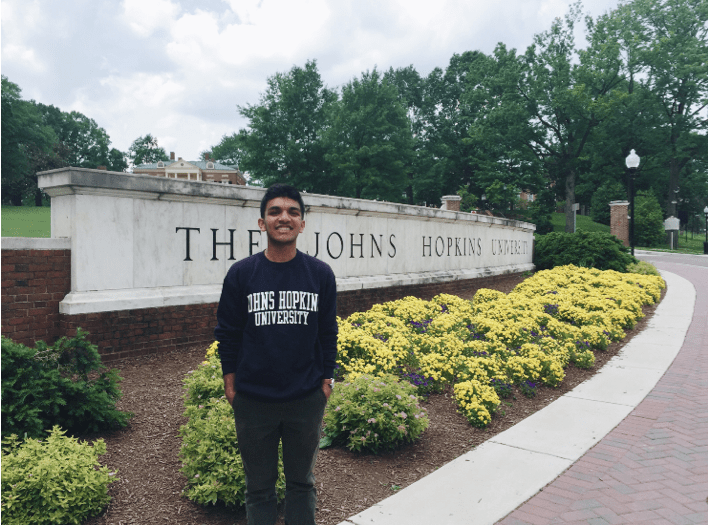 After the session, Doshi learned that he was accepted into the Johns Hopkins matriculating class as one of the thirty-one students. With support from his brother, parents, and grandparents, Doshi made the decision to leave high school and join the university at the tender age of 15. “Attending the Early Entrance Program was amazing for me because it allowed me to gain a sense of urgency. It made me realize that every single thing that I did counted from now on and the only path to success was working hard and smart,” Doshi stated. Doshi made sure to make the most of his two years at the Early Entrance Program. He immediately joined and became a leader in many clubs on campus, including the American Medical Student Association, Chemistry and Biochemistry Club, and the TEDx club. He was a Dean’s list recipient in every quarter of his attendance and received special recognition from the Honors College several times. He rotated with doctors at USC Keck School of Medicine during his freshman year in order to expose himself to the many areas of medicine. However, he didn’t stop there. In the summer after his freshman year, he started researching with a gastroenterologist at Cornell Medical School for two and a half months. Doshi studied issues in the GI tract, especially those pertaining to pancreas. Doshi led his own project and published a unique use of EUS-Guided Drainage for recurrent pancreatitis as a first author. He contributed to several other projects, including an academic paper that showed the different types of management of pancreatic fluid collections. After coming back, he resumed different medical research at both USC and UCLA. After deciding that Public Health was the major for him, he applied to Johns Hopkins. At Johns Hopkins, Doshi plans to become heavily involved in the community as well as conduct research at the world-renown Hopkins Hospital. He is in the process of learning about Medical School admissions and has started preparing for the Medical College Admissions Test (MCAT). “My grandpa always wanted his grandkids to go into medicine and that’s exactly what I plan on doing,” said Doshi.